SAP Master Data Governance is a Master Data Management solution and controls, harmonizes the master data process in the company. Master data is the beating heart of your organization. Without it, you’re dead in the water. 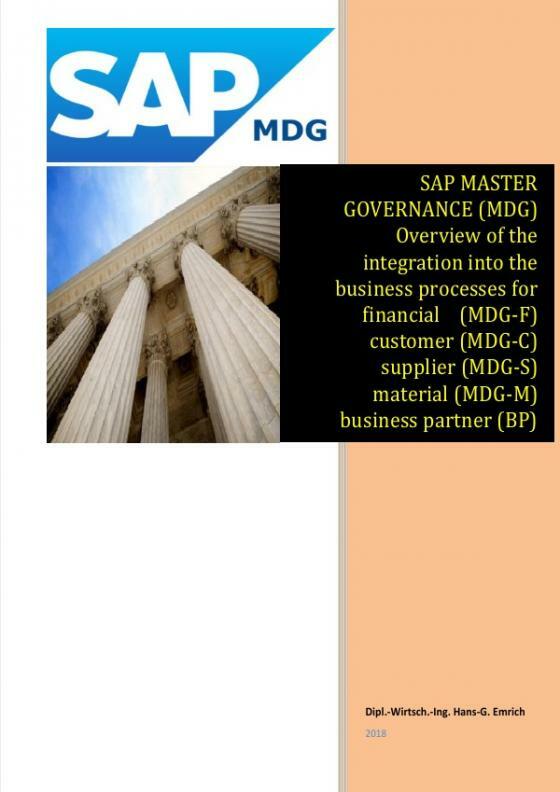 This book is a description of the use of SAP-MDG. It is designed to provide project managers, IT managers and departmental managers with an overview of the application of MDG. MDG is a software tool that directly intervenes horizontally and vertically in business processes. The SAP MDG requires a system and business integration in the company. The book provides an overview of the MDG architecture, integration and implementation into the business process. Examples of implementation and project structures are presented. The book will serve the project manager as a compass. Due to the large number of different company structures and different handling of business processes, not all possible variants of business processes can be mapped. The company, which wants to introduce MDG must be clear that not only an SAP module is implemented, but rather established structures are changed. The MDG stands and falls with the degree of integration or integration. The audience of this document can be business analysts, techno-functional analysts, business process experts, master data experts, solution architects, technical developers, data scientists and customers.